Labour has called on the chancellor to remove the requirement for nurses to swap one day’s annual leave for a pay rise above 1%. 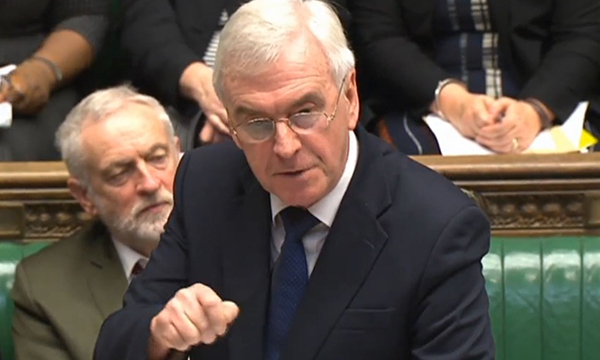 Shadow chancellor John McDonnell used his response to the Spring Statement to attack the government on the leaked pay deal, which suggests nurses could receive a 6.5% pay rise over three years. Referring to Chancellor Philip Hammond, Mr McDonnell said: ‘We are expecting the pay offer to NHS staff shortly – forced on him by the Labour Party’s and trade unions’ campaigns against the pay cap. Mr Hammond had told the House of Commons in his statement that, after a decade of economic hardship, there was ‘light at the end of the tunnel’ and indicated there would be further investment in public services later this year if forecasts are positive. On the NHS, the chancellor said the government is investing £9 billion extra for the NHS and social care system, with £4 billion going into the NHS in 2018/19 alone. He also signalled an £80 million investment in the apprenticeship levy for small businesses during the spring statement. This could be used by GP practices, small community trusts and social care providers to pay for nurse degree and nursing associate apprenticeships. Responding to the statement, Mr McDonnell said: ‘Hasn’t he listened to the doctors and nurses, the teachers, the police officers, the carers and even his own councillors? He later added that the chancellor and his predecessor had not tackled the deficit and had simply shifted it onto public services and NHS staff. ‘NHS Trusts will end this financial year £1 billion in deficit. Doctors and nurses are struggling and being asked to do more, while 100,000 NHS posts go unfilled.